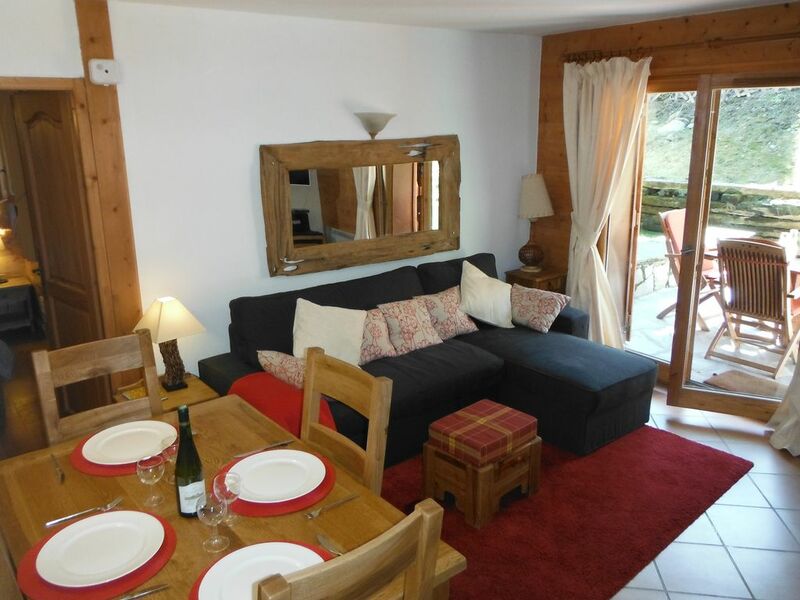 Les Houches, groundfloor 2 bed apt, approx 100m to lifts, south facing terrace. Master bed has large double & onsuite shower, bathroom with bath, sleeps 4 best. This property has recently been given a 3 Etoiles/Star rating for 5 persons by Offices de Tourisme. The apartment has Wifi and is on the ground floor with direct access to a small terrace and communal garden. There is a ski locker and garage with internal access to the Apartment. Additional Internal parking may also be available a short distance from the apartment. The building is less than 100m from the nearest chair lift and cable car, open in summer and winter. The Apartment is fitted to a high standard, with traditional furnishings. In the kitchen there is a dishwasher/oven/microwave, raclette and a large fridge. T.V. giving access to the internet, DVD's, Games and a CD player are provided. In the entrance hall there is a boot dryer. In the family bathroom there is a full size bath and quality Grohe shower with a new washing machine. In the double bedroom there is a new quality King Size Bed (1600 x 2000mm). In the second bedroom, there are 2 single beds. In the living area there is a pull-out sofa bed, which is the size of a small double. Please note that an additional charge is made for bedding if there are more than 4 people. The Apartment has a south-facing sheltered garden area. In the summer outdoor furniture and a BBQ are provided. For those people with limited mobility, there are 18 steps between the entrance and the apartment door. The ski area in Les Houches is 'family friendly', the rest of the Chamonix Valley is easily accessible by bus, car and train. The bus stop is at the cable car. The train station is a 15 minute walk from the Apartment. By using the ski bus or the train, you can access the other ski areas in the Chamonix valley, which are world famous, with something for everyone. The train also allows you to access the ski areas of Megeve and St Gervais. In summer Mont Blanc is stunning, and cycling, walking and paraponting are wonderful! Les Houches has a selection of good restaurants, with several just a short walk away. There are numerous bars and 2 supermarkets. We have always loved the variety of skiing available in Chamonix and have challenged ourselves with Valley Blanche on more than one visit. Our children are keen snowboarders and feel that the situation of the property will offer us skiing in the winter and mountain biking and walking in the summer. Short downhill walk to Bellevue lift in the morning. When returning to the Apartment, you can exit the Kandahar run from the bridge to the road where again there is a short walk downhill to the Apartment. Close to Ski bus, excellent bakery, deli, bar, coffee shop and restaurants. In the summer there is a south facing garden for sunbathing/relaxing. Les Houches has its own train station, which is 15 minutes walk from the apartment.When the Station Ticket Office is not open, you can buy your ticket on the train.You can access the ski areas of StGervais and Megeve. The Train will also take you to Sallanches and from here you can access Paris,Lyon and Geneve. In the other direction, you can access Chamonix and Le Tour. The family bathroom has a new washing machine installed. External parking is available at the front of the building, on a first come first served basis. There is also a large car park approx 100m at the Bellevue Lift station. Situated underneath the building with internal access to the apartment. L shaped sofa which pulls out to form a double bed. Large with small freezer compartment. A range of pans and utensils including Racellette and Fondu. A range of DVD's suitable for all ages. A range of books for all ages. There are Tennis courts approx 100m up the road by the lake. Les Houches is a small village, still largely farming, just 10 mins drive from Chamonix town.It is easily accessed, just 50 mins drive from Geneva airport, 15 mins from St Gervais station. From Les Houches a large number of ski areas can be accessed, including Megeve, Chamonix, St Gervais, Les Contamines and a little farther away the Portes du Soliel. 26kms from Les Houches, through the Mont Blanc Tunnel you can access Courmayeur and the Aosta valley. Prices are for the property per week in UK Pounds. Weeks usually run from Sat to Sat although short breaks are available at selected times, arrival is usually after 4:00pm and departure 11:00 am. Les prix sont pour la propriété par semaine en livres britanniques. Les semaines se déroulent généralement du samedi au samedi, bien que de courtes pauses soient disponibles à certaines heures, l'arrivée se fait après 16h00 et le départ à 11h00.